With 195 rainy days per year and 2.250 mm of the annual rainfall, Bergen in western Norway is considered to be the wettest place in Europe! Even if September clouds should pee a lot, in five days of my visit I never needed an umbrella! The incredible luck with Bergen weather allowed me to explore this pretty town lengthwise and crosswise. And now I can tell you: whether it will rain cats and dogs, or the sun will shine dawn-to-dark, you will find plenty of amazing things to do in Bergen! I present you my own Bergen travel guide – the top 15 tips for visiting the rainiest European city! Bergen is the city of the seven mountains. They offer great views! Bergen is located on the peninsula of Bergenshalvøyen, in Hordaland County, western Norway. Its name derives from the word Bjørgvin (“the green meadow among the mountains”) – the city is nested between seven mountains! As the second-largest city in Norway, Bergen has 280 thousand citizens. King Olav Kyrre founded Bergen in 1070. In the 13th century, Bergen was the capital of Norway. Until the 1830s, it was also the largest Norwegian city, when Christiania (Oslo) took over. Following on its long trading history, Bergen remained the busiest Norwegian port, both with freight and passengers. Why is Bergen so rainy? The geographic position is causing high rainfall in Bergen. The surrounding mountains “stop” the moist air from the North Atlantic, resulting in abundant rains. The longest recorded period of constantly rainy days was from October 2006 till January 2007 – the rain didn’t stop for 85 days! That itself justifies the nickname of the Rain City. Despite its title of the wettest place in Europe, Bergen doesn’t get “ugly” winters. Protected by the same mountains that make it so rainy, the city experiences mild winters. It snows rarely. In winter, Bergen can be up to 30 degrees warmer than Oslo, even if they share the same latitude. With that in mind, Bergen is a destination attracting tourists all year round. But most of the visitors prefer spending their Bergen holidays in summer. The high season is between May and September. In summer, the temperature in Bergen reaches the 20s. The average Bergen temperature in July is 15 degrees Celsius, and in January, the coldest month – 2 degrees. Check the exact weather conditions in Bergen on the most reliable Norwegian weather forecast website – yr.no. How to get to Bergen? Bergen is easy to fly to. Many direct international flights serve Bergen Airport – Flesland. If you prefer slower travel, the Bergen-Oslo railway is often labeled as one of the best train journeys in the world. The famous train route is also Bergen to Flåm, but it is even possible to go by train from Bergen to Tromsø, in the far North. In my case, I arrived in Bergen from Stavanger by bus. The trip included jumping on a couple of ferries. Bergen is connected by ferry to other Norwegian towns, but also Denmark. If you have rented a car, driving to Bergen at your own pace, through the spectacular scenery of the fjords, mountains, waterfalls, and coastline, is probably one of the best choices. Now that we’ve covered the basics, what to see and what to do in Bergen? 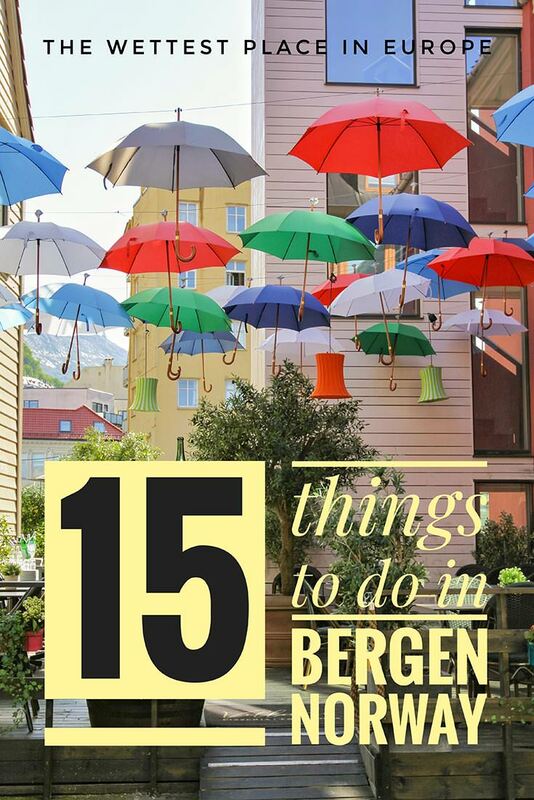 Here are my suggestions for your Bergen city break! First thing first. Usually, I’m not a person who opts for tourist cards, as I also don’t like rushing when exploring, and those cards typically bring benefit if you use them a lot in a short period. But Bergen Card offers so much that its value highly exceeds its cost. In Norway, which is not a cheap country, purchasing the card that provides numerous free and discounted services, especially in a “City of Culture”, makes so much sense! You will save a lot, particularly if you decide to visit Bergen for its cultural offer! 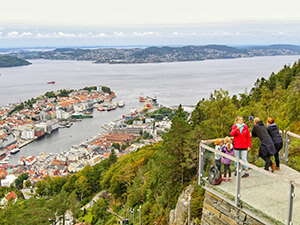 Bergen Card provides you free use of buses and Bergen Light Rail in the city AND Bergen region, as well as the free admission to most attractions and museums in Bergen’s touristic offer. Also, a variety of cultural and sightseeing attractions, as well as restaurants, apply discounts when you present Bergen Card. For adults, the best option is to purchase 72-hour card; it costs 410 NOK (42 Euros). Of course, there are discounts for students, seniors and children, as well as cheaper 1-day or 2-days cards. 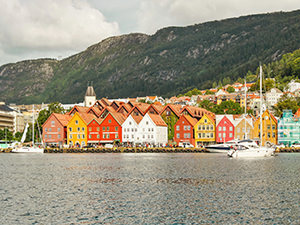 If you recall anything specific about this town, it is probably the iconic image of Bergen tourism – the aligned colorful houses of The Wharf in Bryggen. It is one of those ultimate things to see in Bergen! Located right at the Vågen harbor, just opposite to the Bergen tourist office, they were the nucleus of the town since the 12th century. Often devastated by fires, the neighborhood always reemerged from the ashes. Today, it is under the protection of UNESCO’s World Heritage. These Hanseatic buildings were a foremost market place in the Middle Ages. But the commercial spirit of the trading port survived until today! Shops here will still sell you some unique Bergen souvenirs! Besides for shopping, these narrow alleyways and overhanging galleries are a great photo opportunity. Snap some pics while you are here, as they are screaming postcard-perfect. If you want to experience Bergen of yesterday literally, take a short bus trip to the Gamle Bergen Museum (Old Bergen Museum). You will visit the reconstruction of Bergen as it used to be, with citizens included! This small town consists of fiftyish houses from the 18th and 19th century. They moved them here mainly from Bergen city center, populated them with actors and brought history to life. Visitors are free to wander around and through the houses. You can see how barbershop, dental practice or a colonial grocery store looked in their time. Find out why the youngest sailor’s child sleeps in a drawer of a chest, or what’s for lunch at the officer’s house. Four times a day, the actors engage in a small theater play on the main square. It is 1886, and in one of the houses, I give a hard time to a servant called Anna. Master and his wife went to their summerhouse, but she gladly shows me around their home. In the backyard, two toilet cubicles are where even the rich sometimes have to go. I ask Anna if one of the toilets is for her needs. She stares a bit lost. “Well, where do you pee?”, I openly ask. “They” are the museum management. Anna was jumping in and out of her character, while I only tried to talk to a 19th-century servant who did not adequately prepare for a curious visitor. Visit Old Bergen Museum if you want to learn something. And if you don’t learn it, you can at least have fun! 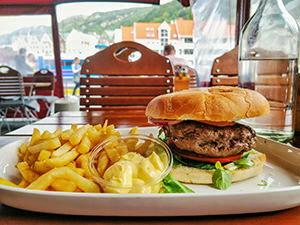 The mid-day hunger strikes and you ask yourself – where to eat in Bergen? Stay in the museum spirit! Bjellands Kjokken is a kitchen frozen in time. On Nordnes peninsula, at the address Strandgaten 201, this tiny place with just five tables serves traditional Norwegian food. Behind the electric stove, Randi Bjelland bears her 85 years of age quite decently. She came from Lofoten when she was 17, for studies. When she speaks about her home, there is this expression of nostalgia and pride. The decision is made: she will prepare me a codfish, from the seas around Lofoten. This charming old chef lightly dips the fish in flour and fries it in butter. For the salad, she grates some carrot and apple, sprinkling them with lemon juice, so they don’t go brown. Potato is cooking in a pot, with some weight on the cover, so it doesn’t fly away. It takes some time, so she takes some potato from before, and heats it in the microwave. She adds her combo of sour cream and mayo, and voila! A plate is ready. “It is a good fisk”, she says, serving it with a “k”. She lights a candle, and only then approaches the next customers who were patiently waiting for her to finish my meal. There is no rush in this kitchen. Food preparation deserves attention, and Randi does everything by herself. She offers me some carbonated drinks. “I don’t drink them myself”, she says. “Maybe sometimes a bit of wine. And lots of fish”. 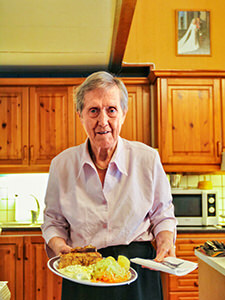 At 85, she might not hear perfectly, but she has the longevity recipe. And it is free and straightforward. For the meal, she charges 200 NOK (20 Euros). 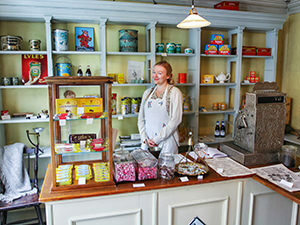 Unlike most places in Norway, Bjellands Kjokken does not accept credit cards. It’s logical; the credit card machine would just not fit into this ambient of times gone by. Museums in Bergen are the places where you can easily get lost. Especially if you’ve purchased Bergen Card! There’s no way to fit it all in one afternoon! So select your favorites! Even if here I propose you a 48-hour itinerary, remember that I visited Bergen in five days! 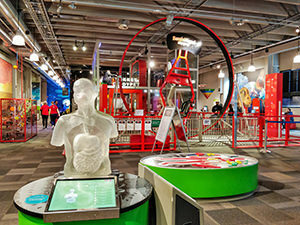 VilVite or Bergen Science Centre is an interactive exhibition for curious minds. If you are interested in science and technology, and especially if you are visiting Bergen with a toddler, this is the place where your whole family can engage in fun experiments. The highlight is probably the bicycle that you can ride on a 360-degree loop! For history buffs, there is the History Museum (University Museum of Bergen), where I was surprised to find an exciting church art exhibition. On the other hand, I was a bit disappointed with Bergen City Museum (that included Bryggens Museum, Håkon’s Hall, Rosenkrantz Tower). The way they presented the information there, and the overall quality of the displays, was pushing me to rush through them as if I wanted to claim my time back. Instead, I spent quite some time reading the engaging explanations in the Leprosy Museum (former St George’s Hospital). Bergen Maritime Museum is also lovely, if you are into ships, big or small. For art lovers, the collections of your interest are conveniently centered around the Lungegårdensvann Lake. 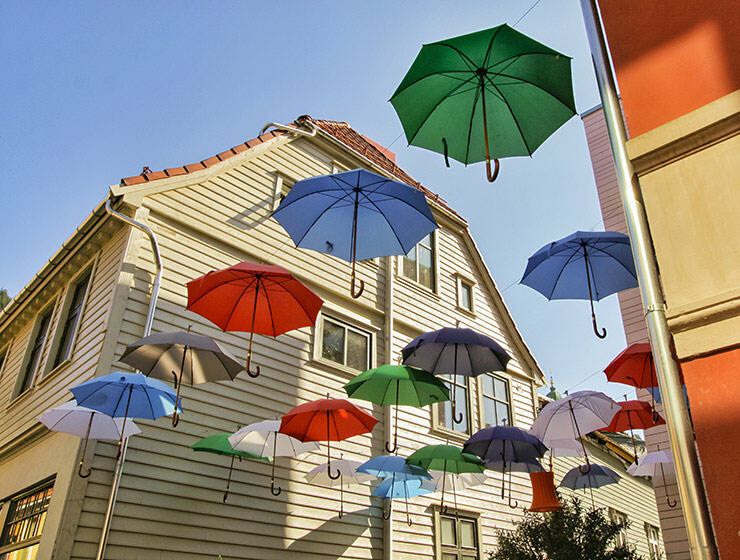 Informally called Bergen’s Art Street, the attractive offer includes Bergen Kunsthall (Bergen Contemporary Art Centre), four buildings of KODE museum with masterpieces from Munch to Picasso, as well as Kunsthall 3,14 and KRAFT, both housed in the old bank building facing the Fish Market. Rain city is not always wet! Exhale from all this content at Byparken nearby. 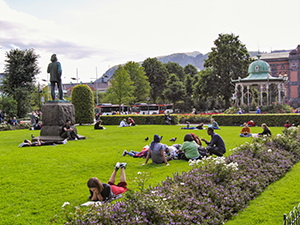 On a sunny day, the meadow around Edvard Grieg statue is locals’ favorite spot to lay down, meet friends and just relax. The nearby Music Pavilion was cast in iron in 1888, and is a beautiful photo spot. You can try some unusual flavor combinations in Bergen! 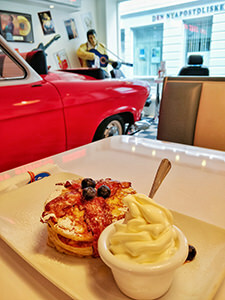 Norwegians like an unusual combination of flavors, so it is not strange that the Roll&Rock American Diner can sell them the silver dollar pancakes topped with slices of bacon, soft ice-cream and blueberries! This particular combo will cost you 164 NOK (17 Euros). Chew on your bacon in the company of Elvis Presley, while sitting in a Cadillac or yellow cab, for that ultimate Americana experience. Bergen hotels can get quite expensive. With luxury hotels catering for wealthier tourists, and the competitive market of bed and breakfast options, finding cheap accommodation in Bergen is not easy. Your dilemma where to stay in Bergen does have an answer though! Marken Guesthouse is a centrally located hostel that provides decent accommodation that will not break your budget. Whether you join the backpackers in the dormitory or prefer the privacy of a double room with your own bathroom, this big hostel will be able to accommodate you. Rooms in Marken Guesthouse come with comfortable beds, stylish wallpapers, designers’ pieces of furniture and pleasant décor throughout. Common spaces include seating areas, but also a big dining room with kitchen where you can prepare your meal and save a bit more of your Norwegian travel allowance. 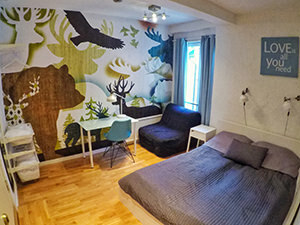 Check the best prices at Marken Guesthouse on this link, or check the prices of other accommodation options in Bergen, Norway. Norwegian fish and cheese is a good way to start a Norwegian day! Just 300 meters away from the Marken Guesthouse, treat yourself with a grand breakfast at Grand Hotel Terminus. 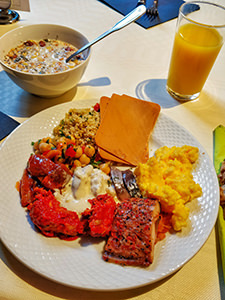 Their generous buffet uses fresh, local produce, and while fulfilling all general croissant-cereals-eggs-fruit expectations, it tops it with a variety of traditional cheese and fish. This can fill you up quite well for another day of exploring Bergen. Plus, you can buy the breakfast voucher at Marken Guesthouse directly. Time to use your Bergen Card for free transport and attractions again! Head to Fana borough south of the city of Bergen, by using Bergen Light Rail. 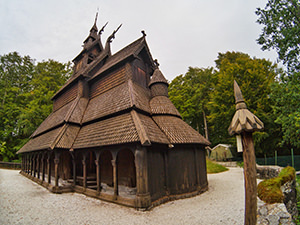 The area is mostly known for Fantoft Stavkirke (Stave Church), the imposing blackened wooden construction that was first erected in 1150s, without a nail connecting its planks. Originally, it was built in Fortun, a village northeast of Bergen, but after the villagers started dismantling and repurposing its material for their farms, Bergen businessman bought it and moved it to its today’s home. In its war against Christianity, black metal musician Vikernes burned the church to the ground in 1992. Black metal fire in those years swallowed 22 stave churches! The new Fantoft Stave Church is therefore not the original, but a faithful reconstruction. The only original element that survived the fire was the crucifix. The weather might often be gray in Bergen, but the buildings make up for it! When you get back to Bergen city center, take some time to explore the town’s street art scene. In the past two decades, Bergen walls became a colorful expression field, both for local and international artists. While Bergen municipality removed the early wall art, including some original work by Banksy at the beginning of the century, today it allocates the money to the street art projects. 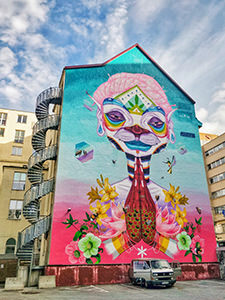 Bergen quickly gained the reputation of the street art capital of Norway. I have no particular place to direct you, but keep your eyes open when walking the city, as you will undoubtedly notice vivid facades popping up in front of you! If you didn’t get your stomach fed on some morning stroll through the Fish Market, now’s the time not only to gaze! You could sit at the Fish Me restaurant just next to the Tourist Information, and try the Norwegian version of the iconic fast food! The menu is rich with seafood choices, but try ordering the whale burger! It comes served with French fries and aioli, and costs 220 NOK (23 Euros). Well, 10 percent less if you wave your Bergen Card! Bergen is known as the city of seven mountains. 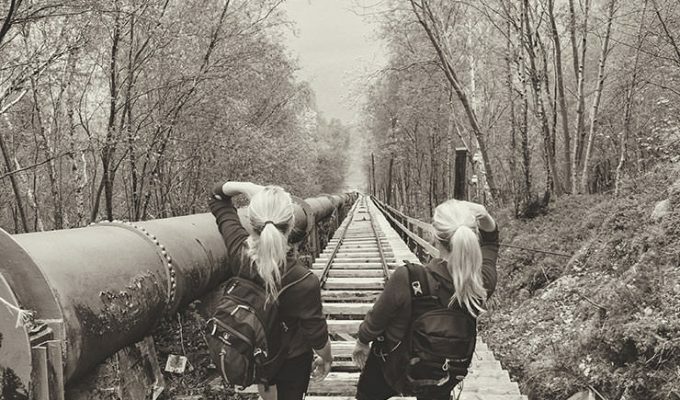 Exciting hikes in nature are literally at your doorstep! The easiest one to get to is Mt. Fløyen. You can take the Bergen funicular called Fløibanen to the top, and continue hiking from there! The return trip with the funicular costs 95 NOK (10 Euros). With Bergen Card, it is free from October till May, and half-price in the rest of the year. Once you are up, you will notice an unusual sight – 10 goats roam the grounds. They are kept there without any fence. That’s because Norwegians employed the Nofence grazing technology. The first of its kind in the world, it creates an invisible GPS fence. 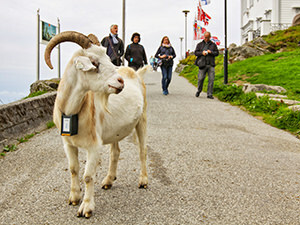 Powered by solar energy, the collar on the goat tells it when it crosses this “wall” with the particular sound followed by electroshock. Animals quickly learn the principle. On the other hand, these goats have no reason to leave anyway. It seems they are well-fed, and can only enjoy laying around some of the best viewpoints of Bergen. The area on the mountain is excellent for walking and playing. 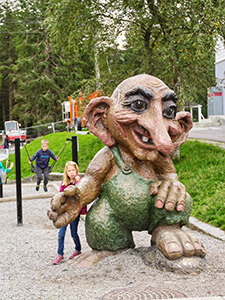 Your family can look for trolls in the Trollskogen, the enchanted forest with wooden sculptures of these mythological creatures. Alternatively, your kids will enjoy the physical fun experiences provided by the playgrounds. You are dying to know how Tubakuba looks inside? Well, only families with children can check it out! 14. Spend the night in the rabbit hole – for free! Up in the mountain, there is a place you can sleep, free of charge! Well, you just need to have at least one child, as that is your family’s entrance ticket to Tubakuba (Tuba Cube). Hidden by the forest, on the edge of the cliff, with a wall-to-wall window overlooking the Bergen cityscape, Tubakuba is a fantasy getaway! The builders innovatively used the curved wood to create an organic portal into this hidden mountain oasis. 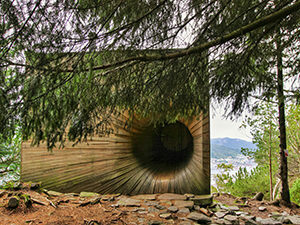 The unique cabin with a rabbit-hole entrance is the result of the work of Bergen School of Architecture students. The idea was to create the climate-conditioned environment for an overnight stay in the mountain that would provide children with comfortable outdoor living experience. Tubakuba is 14 square meters in size and can fit up to five people (two adults and three children). Every family can book it only for one night a year, and advanced booking is required. You can reserve your space in this one-of-a-kind forest cabin on Bergen Municipality website. 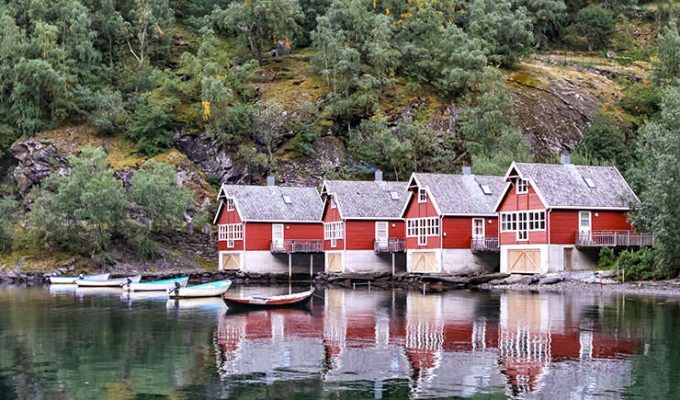 Bergen is so close to the fjords, that it would be a shame to miss this iconic part of the Norwegian landscape, dotted with foaming waterfalls, spectacular cliffs and idyllic villages! 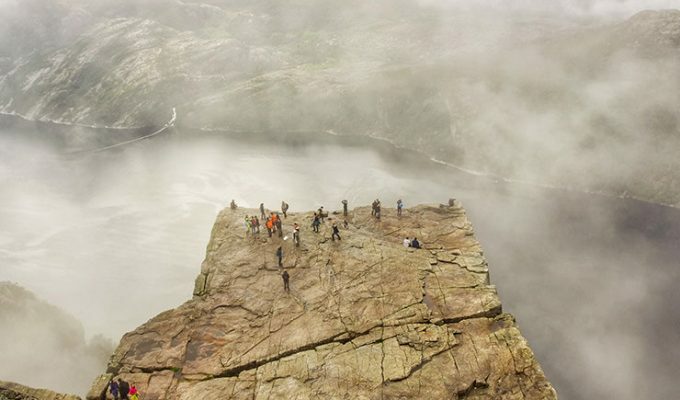 In Norway, there are more than a thousand fjords of various sizes. But the two of the longest ones and supposedly the most beautiful ones are very close to Bergen – Hardangerfjord and Sognefjord. 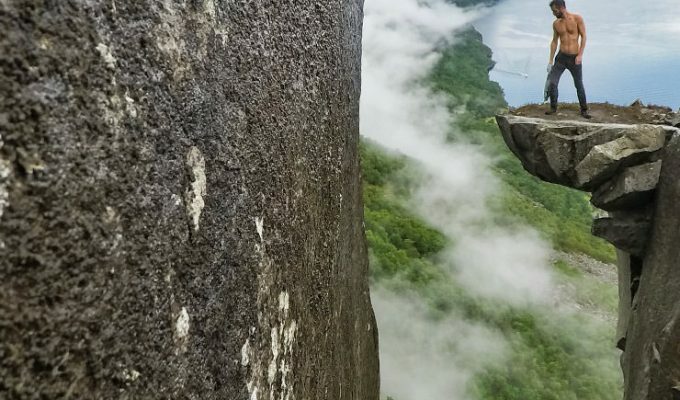 I can personally recommend Aurlandsfjord, one of the side arms of the Sognefjord, and Lysefjord, close to Stavanger, that provides some fantastic hiking opportunities (Preikestolen, Kjerag, Flørli). Follow these links to discover where to go from Bergen, the rainiest city in Europe. 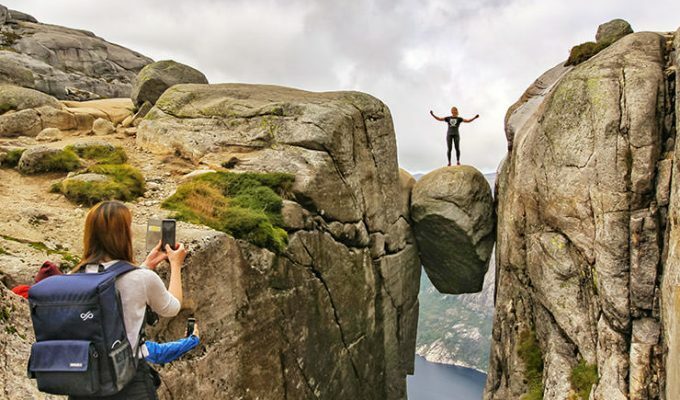 Whether you choose Bergen as a destination, or as a gateway to other places in Bergen area, you can expect a rich array of things to see and do. Bergen sites are especially interesting if you are into rich historical and cultural heritage, admirable seafood gastronomy, traditional architecture, urban interventions, or fantastic nature. And if you are not allergic to rain. If you are lucky like me, you just might experience those rare sunny days in the wettest place in Europe! Disclosure: My Bergen Card, my breakfast at the Grand Hotel Terminus and partially my stay at the Marken Guesthouse were complimentary, but all opinions are my own. Bergen certainly looks like an interesting place to visit. I’m not so sure about all the rain, but there seem to be plenty of museums to keep visitors busy on a rainy day. 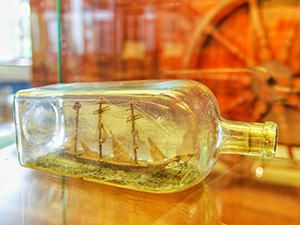 The Old Bergen Museum will definitely appeal to those who like to step back in time. Thanks for your comment, Gearoid! Bergen is certainly the town we should all know more about. And what’s the best – it can serve as a school to the whole family!